As Lockheed Martin prepares to send Joint Strike Fighters to customers around the world, Japan has released a photo of its first F-35 purchase at the production facility in Texas. Deemed combat-ready earlier this month, the F-35A variant will soon be delivered to international partners. On Sunday, the Japan Air Self-Defense Force (JASDF) published a photo of a newly completed fighter that, after completing flight tests at Luke Air Force Base, will be distributed to Japan. The F-35 bears the serial number 69-8701, and has also been designated AX-1. The fighter is one of four currently in production for the JASDF at the Lockheed Martin facility in Fort Worth, Texas. In all, Tokyo plans to purchase 42 F-35As, the traditional takeoff and landing variant. Of these, 28 will purchased within the next five years. These will replace Japan’s aging 1960s-era Mitsubishi-McDonnell Douglas F-4J Kai (Phantom II) aircraft. Tokyo has also made repeated requests to acquire a fleet of F-22 Raptors, but has so far been denied by the US government. 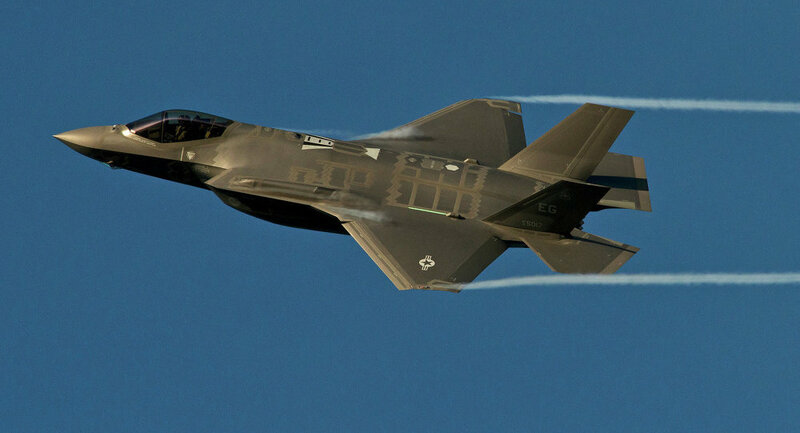 At a cost of over $1 trillion, the F-35 is the most expensive weapons system ever built. Despite these costs, the aircraft has been riddled with problems throughout its production, including software glitches, engine malfunctions, and flight performance issues. Despite being deemed combat-ready, the fighter still suffers from an ejection seat malfunction that could place the lives of pilots at risk. The US Air Force is currently troubleshooting the issue. Now that the beleaguered F-35 joint strike fighter is, according to official statements, flight ready, the US Air Force is faced with a new problem: upgrading bases abroad to accommodate the aircraft. The Royal Air Force base at Lakenheath, England, is preparing to accept a fleet of 54 F-35s by 2020, with the first batch to be stationed overseas. While the plane has seen its share of troubles, including software glitches, faulty engines, and flight performance issues, Col. Robert Novotny’s chief worry is the base itself. The upgrades include maintenance requirements needed to accommodate the plane’s unique features. “There is some construction that needs to be done for the communication bandwidth requirements that we don’t have here, and there are some infrastructure improvements, power wise, because there’s going to be a lot of demand on the power system,” he said. New housing and living facilities will also be needed for some 1,200 new military personnel needed for the fleet. But while the RAF needs to spend roughly $200 million in making upgrades to base facilities, Novotny isn’t sure the money will be provided in time. Additionally, he expressed concern that a number of other military bases in the region are also in need of upgrades, and Lakenheath may not get priority. “We’ve had about three or four formal meetings with folks from the United States and the [UK] Royal Air Force and Ministry of Defense. These are big meetings. The engineers come in, we’ve looked at our power requirements, we’ve looked at our connectivity requirements. We’ve looked at our space on the flightline,” he said. It may be a while before plans come to fruition, however. The estimated completion date has already been pushed back to 2022, two years after the first F-35s are scheduled to arrive. The flawed design of the Martin-Baker ejection seat means another major delay in production of the aircraft and hundreds of billions of dollars in costs for US taxpayers. The US Air Force is exploring replacements for the F-35 Martin-Baker ejection seat, citing revelations that the seat could endanger pilots, according to Defense News. This marks the latest setback for the F-35 fighter jet that has cost US taxpayers over $1.5 trillion. The decision to consider alternatives to the Martin-Baker ejection seat followed a government report finding that pilots below 136 pounds faced a high likelihood of suffering a fatal neck injury upon ejecting from the fighter jet. Pilots weighing between 136 and 165 pounds also face an “elevated level of risk” due to the defective ejection seat. Ejection seats hold a special importance for pilots of the $250 million fighter jet in light of recent tests that show the fifth-generation fighter spontaneously shuts down mid-flight due to ongoing software malfunctions. After a steady stream of delays, the advanced aircraft was not expected to be cleared for mass production until sometime in 2019, the planes being combat-ready by 2021. Industry experts believe that the defective Martin-Baker ejection seat risks delaying production of the F-35 even further by disrupting Lockheed-Martin’s supply chain and workshare strategy. Despite the potential for enhanced delays in the fighter jet that has cost the American people more than the gross domestic product of all but the eight richest countries, Air Force Lt. Gen. Arnold Bunch, the service’s top uniformed acquisition official, confirmed that the service intends push forward, potentially relying on United Technologies’ ACES 5 ejection seat as an alternative. The US Air Force is slated to buy 1,763 F-35A fighter jets, making it the single largest customer in the program. Given that the Martin-Baker ejection seat included as a generic component in the Lockheed aircraft, other American military branches are likely to run into similar issues. Under the current industrial partnership agreement, UK companies produce about 15 percent of each F-35 jet, creating and supporting over 24,000 British jobs. If the US Air Force does pursue purchasing replacement ejection seats from US-based United Technologies, it will likely still need to pay full cost on the defective seats from UK-based Martin-Baker in order to comply with the agreement. A US Air Force source warned that this complication could result in a substantial premium over the existing cost for the F-35 fighter jet, threatening to bankrupt the fighter jet venture altogether. The US Air Force now faces the troubling reality of either forcing US taxpayers to spend billions in extra expenses for a jet that may not be operable for another decade, or placing fighter pilots into a malfunctioning aircraft without a safe ejection capability. The troubled creation of the Lockheed Martin F-35 is plagued by yet another technical glitch. The Lockheed Martin F-35 is not only an extremely expensive aircraft, but is also probably the most software-driven plane ever constructed. And ironically, it is a new software glitch that now threatens the US Air Force’s plans to finally declare F-35 operationally deployable in the near future.According to IHS Jane’s, the problem lies with the current version of software that runs the warplane’s radar, making it unstable and thus affecting the aircraft’s performance against other airborne targets. “What would happen is they’d get a signal that says either a radar degrade or a radar fail —something that would force us to restart the radar,” Harrigian explained. The problem was apparently first discovered during tests in late 2015. “Lockheed Martin discovered the root cause, and now they’re in the process of making sure they take that solution and run it through the [software testing] lab,” Harrigian said, adding that USAF is scheduled to receive the new software by the end of March. The F-35 fighter jet is probably the most expensive military aircraft ever developed, with an estimated final cost of $400 billion which is twice the original estimate. Problems with the F-35 have included flaws in its fuel and hydraulic systems, poor cockpit visibility, faulty radar and ejection seats that don’t work. The entire fleet was grounded in 2014 after an engine caught fire as a test pilot prepared to take off.